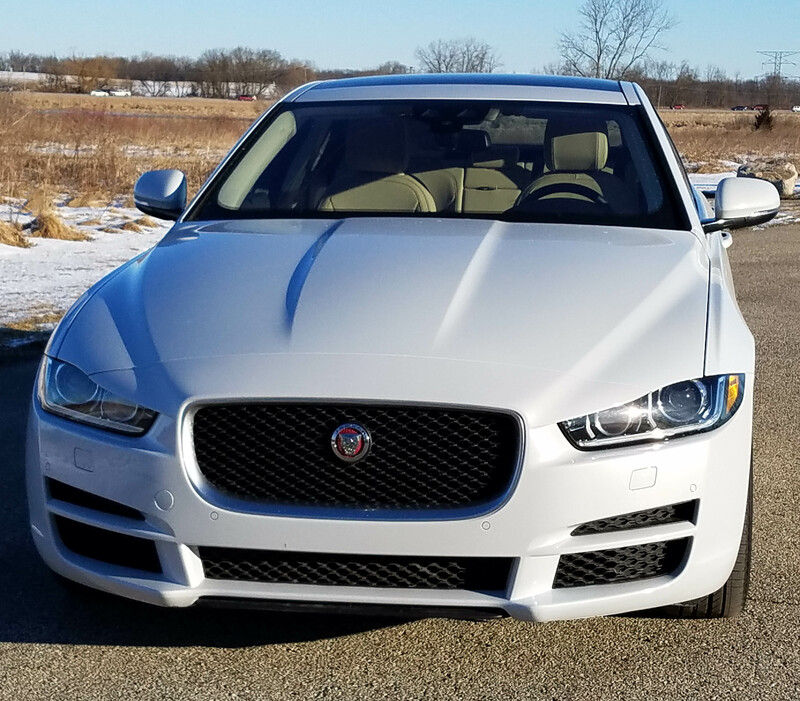 For now, let’s focus on the pretty white test car, the XE 35t Prestige. Its targets include the BMW 3 Series, Mercedes E Class, Audi A4 and possibly the Lexus IS. Each has their advantages, and the Jaguar’s is its looks. Certainly there’s power here with the supercharged V6 hooked up with an 8-speed automatic that you can put into a Sport mode to allow manual shifts via paddle shifters behind the wheel. In Drive the shifts are fairly smooth, but none too aggressive. There also are four drive modes that you can engage via buttons on the console. These affect shift patterns and steering effort. Sport is what you want for performance while Normal is OK for city driving and Eco may save you a smidgen of gas. There’s also a rain/ice/snow mode for sloppy weather. We had some wet streets during my drive and in Normal mode I could spin the rear-drive wheels pretty easily, so the rain mode should help. Naturally you could buy the AWD model and that would solve the wheel spin dilemma too. In Sport mode the XE is quick. The V6 seems to come alive and sings a pretty note too. Shifts are more aggressive and the car will race away from other traffic. 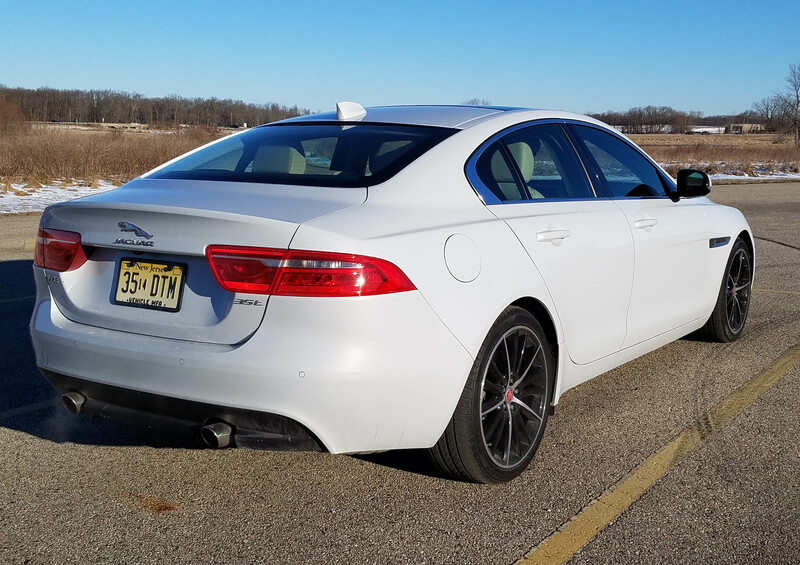 The XE feels much sportier as the steering effort also firms up considerably, giving this a sport sedan feel. In Normal mode all that disappears and you become a typical luxury sedan in a pretty package. You know what Eco does, oh, and there’s a stop-start feature here to save fuel and annoy you at stoplights. You CAN turn it off though! Ride, unlike handling and acceleration, is not adjustable. It’s downright stiff all the time so you feel road imperfections in all conditions. The car is fine on highways and smooth blacktop roads, but cement streets create quite the jigglefest inside. Braking is fine. 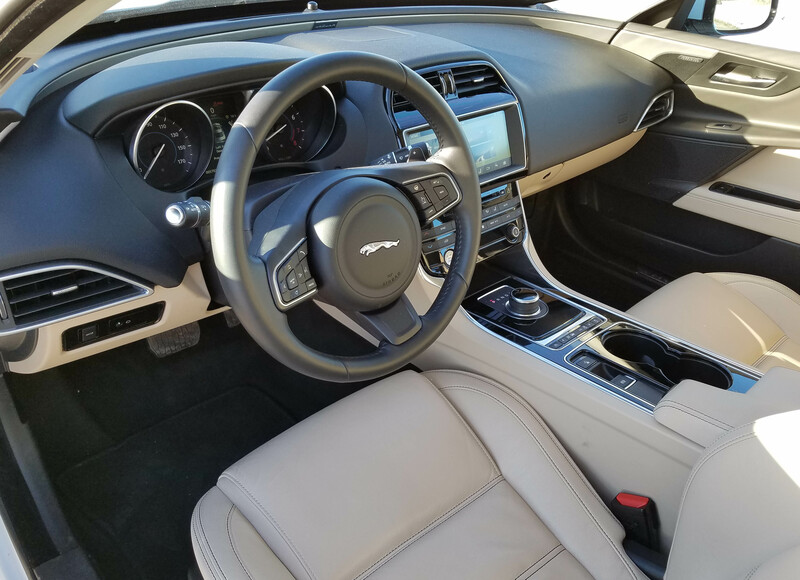 Inside the Jag does not carry over its penchant for fine styling from the exterior. Styling here is tame, muted with its only nod to non-convention a raised dash ring around the front of the dash that blends into the doors. 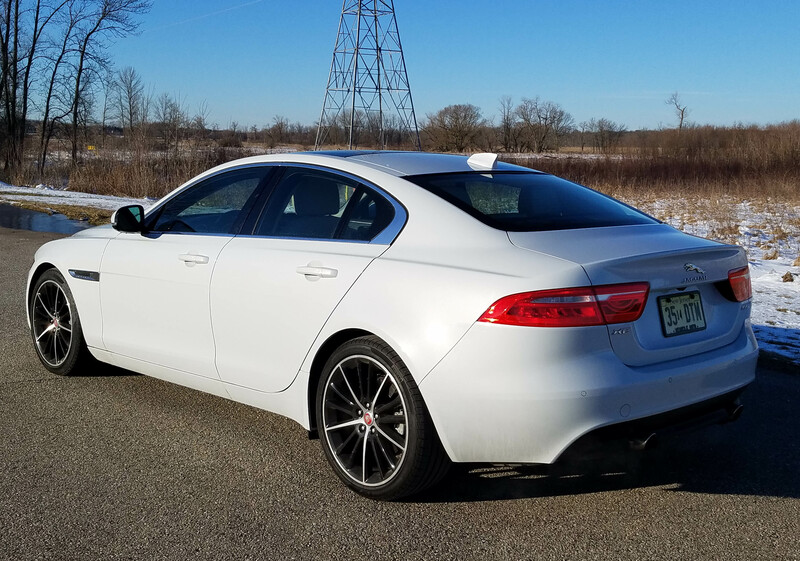 Its overall effect is to make the car feel cramped inside, and indeed, the back seat is quite snug, limiting the XE’s usefulness as more than a two person hauler. The Prestige model has leather seats. These were tan, as were the door inserts and lower portion of the dash. The top was black, as was the leather-wrapped steering wheel. The console and center stack featured a gloss black facing and all is trimmed in satin chrome. It looks nice, but uninspired. 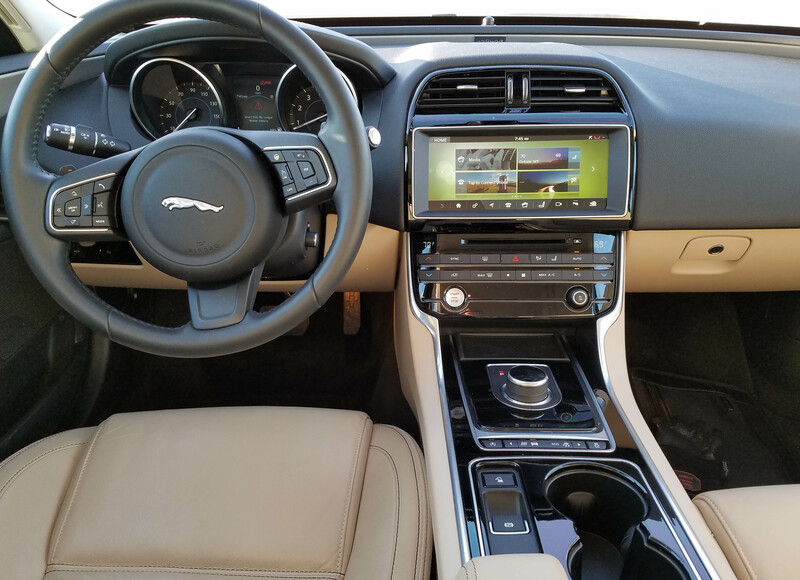 However, on the plus side the Jaguar has a wide screen that is easy to see. It’s both a touchscreen and has some buttons you can use for a few controls. It wasn’t the easiest to use, but not as hard as those controlled solely by a mouse on the console. The radio itself featured a fine 11-speaker Meridian sound system and there’s a CD player in the dash. Overhead is a sunroof and the front seats are heated, as is the steering wheel. Both get extremely warm, so adjusting the seat temp downward after a couple minutes is advised. I could click off the wheel heat about 10 minutes into a drive. The Prestige model also featured a power tilt/telescope steering wheel. Front seats are powered and easy to adjust into a comfortable position, but the driver’s bottom seat cushion is rather flat and hard, so not real comfortable for long drives. The seat back is well shaped and supportive though. The rear seat has precious little legroom, especially if the front seat occupants are more than 5-6 or so. Headroom also is moderate and crawling in and out of the rear seats is best left to pre-teens, not adults. Trunk space is generous, but if you want a split folding rear seat you need to go with a Premium level model or higher. A few safety features are included, but again, to get all that you’d now expect on cars you must keep moving up the trim levels. The tested Prestige had a blind-spot monitor, reverse traffic detection and rear and front parking aids. That means it beeps when you get near a curb or pull into a parking spot with vehicles adjacent. Not having lane departure was fine with me on this model, but it’s standard on the R-Sport edition, along with automatic emergency braking. The supercharged V6 seemed to have a bit of a drinking problem in the test car too. Weather was moderately cold, but I managed just 18.4 miles per gallon and sadly premium fuel is preferred. The EPA rates this much higher, at 21 mpg city and 30 mpg highway. Maybe in warm weather! 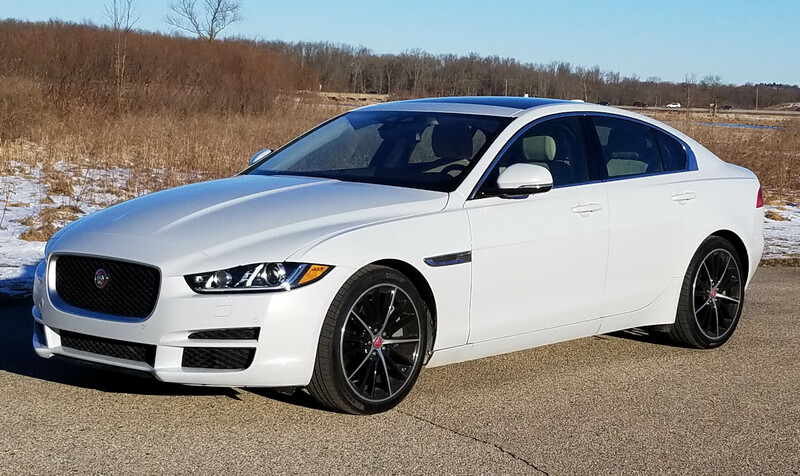 Pricing covers a wide range, starting at $35,895, including delivery, for the XE 25T RWD with its turbo I4. Going with the turbo diesel in the 25T moves the price to $37,395 and adding AWD to the diesel puts the car at $39,895. The tested 35T Prestige lists at $45,600, plus $995 delivery to hit $46,595. A Prestige with AWD lists at $49,095, a 35T R-Sport AWD at $52,695 and the top-level First Edition with AWD at $58,995. That’s getting beyond the entry-level luxury sedan market, but then it’s your wallet! 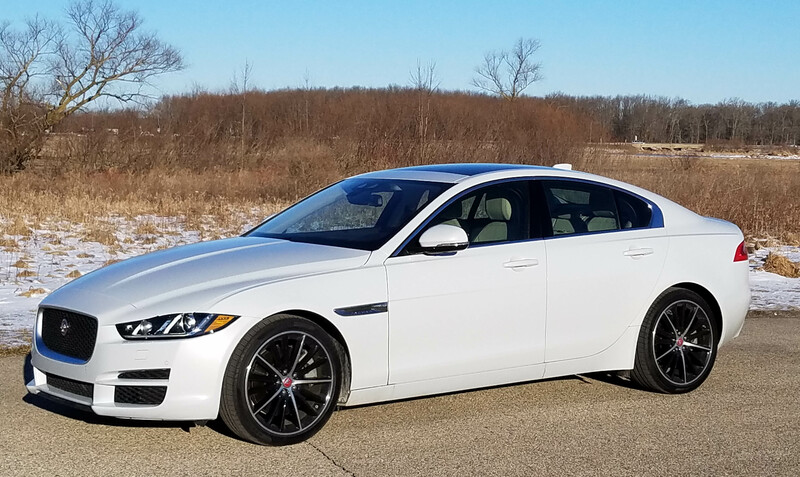 At the low- to mid-levels the Jaguar XE certainly is one of the best-looking sport luxury sedans, and looks matter, sometimes. Hits: Dashing looks, power and handling in Sport mode, wide dash screen, sunroof, heated seats and steering wheel, plus power tilt/telescope wheel. Blind-spot monitor, reverse traffic detection. Misses: Ride too stiff, lower seat cushion too flat and hard, cramped rear seat, drinks premium fuel.